Stallion Brand Teff is a warm season annual grass developed for high forage production and forage quality without the problems associated with other summer annual grasses such as prussic acid or nitrates. Stallion makes the ideal hay for horses with excellent palatability, digestibility and a mineral content high in calcium and iron. The forage is an attractive green color which is important for the premium horse hay market. Stallion is widely adapted throughout the United States and will tolerate various soil and environmental conditions. In general, teff is a low input crop that has very few disease or pest problems and does not require high amounts of fertilizer for optimum yields. 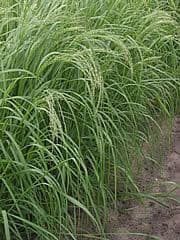 Ask for Stallion Brand Teff when profitable summer forage production is needed. Plant after all risk of frost has passed and when soil temperature reaches 65 degrees. Teff does not germinate well in cool soils. Seeding rate: 8 to 12 lbs/acre for coated seed. Teff needs adequate Phosphorous, Potassium and Sulfur – SOIL TEST. Maximum 50 pounds Nitrogen per acre at planting. Small amounts of N might be needed after each cutting, however too much N causes severe lodging. For optimum quality, harvest in pre-boot to early boot stage, approximately 45 to 50 days after planting. Harvesting after the seed head emerges will cause teff to produce little or no regrowth. Harvest regrowth approximately every 30 days depending on location and environmental conditions. Cutting height is 4 inches minimum.